Photos from Revision taken by H7 and from seminar footage. Screenshots from the Demozoo website. With Demozoo.org the demoscene gained a new website with the possibility to catalog the many productions, graphics and music the demoscene has produced and is rich of. Menace and Gasman are the main persons behind Demozoo and it was about time Hugi paid them a visit to talk about this fresh and modern new demoscene website. To start with this article Gasman and Menace are introducing themselves. First up is Gasman. Following Gasman's example of introduction Menace of amongst others Spaceballs fame takes over. Menace: "Hi, I'm Menace of Spaceballs, Boozoholics, Accession and Keyboarders. 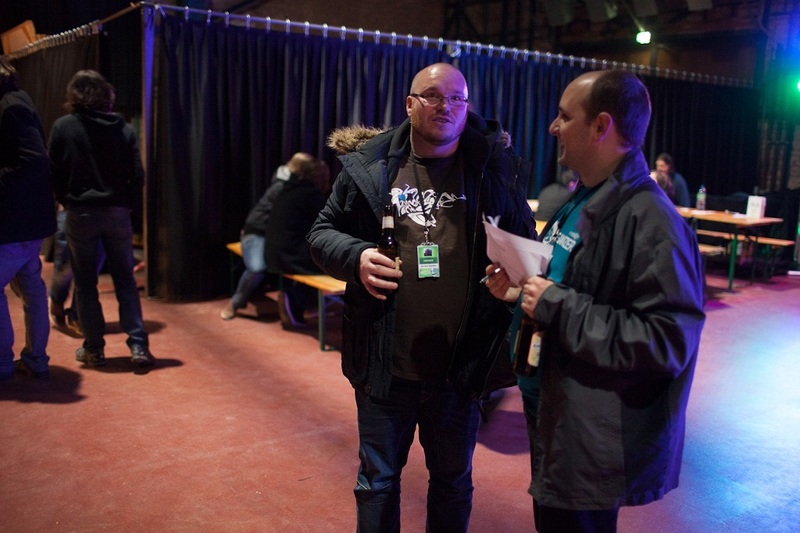 I am a co-organizer of Kindergarden and Solskogen demoparties and a former organizer of Eastergarden and The Gathering. I am a former co-editor of Zine diskmagazine, and a former admin on demoscene sites like BitFellas, BitWorld (shoutouts to Zeg, Asle, Curt Cool and everyone over there) and ArtCity (yo CONS!). I am one of two founders of the demoscene database site Demozoo, along with Gasman, and I am the latest inductee into scene.org, where I work with the file archive, hopefully speeding along your uploads' way from incoming to public and make sure all the bits get in the right place." So, now after they have formally introduced themselves what can Gasman and Menace tell us about the founding of Demozoo? Who started this project and why? What happened in what timeframe the last years to finally make Demozoo go live for the demoscene to visit? Gasman: "The history of Demozoo really goes back to when I first got internet access at the end of the 90s. Considering the internet was hyped up as the sum of all human knowledge, I was expecting to find a gold-mine of new Spectrum demos I hadn't seen before - but there was really nothing out there. My personal demo collection was already bigger than anything I could find online. So, I decided to fill the gap, and created the website Demotopia to put my collection online. Lots of people joined in the effort and contributed with their own collections, and soon the site expanded beyond being just a list of demo downloads, to cover music, graphics and parties. After a while, though, it became too much work to do all the data entry myself - especially straight after a party, when there would be hundreds of new records to add. The website backend wasn't too friendly, and I couldn't invite other people to help out because it relied too much on knowledge that only existed inside my head, like multiple nicks used by the same person. In response to that, I started work on a new site some time around 2008, which would become the first version of Demozoo. I wanted to make use of the lessons I learned on Demotopia, and make the editing process a whole lot smarter so that it could be used by people without expert knowledge of the scene. The goal I set myself was: it should be possible for someone to enter the full set of entries from a music or graphics compo, while the compo is happening, without driving themselves insane. :-) And if I could solve those problems, there would be no real reason to limit it to the Spectrum scene. Unfortunately, it didn't really work out: I set myself a hard deadline and ended up launching it too early, without any of the features that would distinguish it from other sites. Basically, it just looked like an ugly Pouet clone... also, the technology I used (Ruby on Rails) wasn't a good fit. So, it was back to the drawing board... Menace contacted me in May 2010 suggesting that we should collaborate - he came from a background of researching the early days of the demoscene, so he offered to lead the way on the data entry side while I did the coding. We decided that this time round, we'd only launch the site 'when it's ready', and we set ourselves a number of targets, including having the full results data from every demo party ever (or, more accurately, all of the ones on scene.org). The division of roles kept us both really productive - Menace was filling in credits, soundtracks, screenshots just as fast as I could implement new types of data. Often I would roll out a new task to be done, like matching up parties to their scene.org folders, expecting it to keep him occupied for weeks - but it would be completed almost overnight, and he'd be back again asking for the next new feature :-) It encouraged me to stop obsessing over the perfect design, and to start building something functional 'today' instead. Over time Menace recruited various other people to the team, including H7 on design and T-101, Zefyros, Dipswitch, Saga Musix and Lotek Style contributing expertise from their corners of the scene." Menace explains and adds: "Basically, it seemed like my idea of what I wanted to do was the same as Gasman's idea with the first incarnation of Demozoo. So I sent him an email, explaining what I wanted to do, and if his plans aligned with mine, perhaps we could join our efforts? So, basically, Gasman runs everything on the technical side (servers, databases, code) and I run the content and management side (including recruitments to content staff, editorship of the front page, and a stupid amount of time spent adding parties and productions). As for the timeframe, we started talking in mid 2010, and launched in december 2013 - so it took a good three years. We committed to a hard deadline during our seminar talk at Revision 2013, and the last few weeks leading up to launch I spent two hours every morning from 5 to 7 entering party results before I left for work, in order to get it done. With a new baby in the house at the time, it was the only free time I had." And what can Menace tell us about future features for the Demozoo? "Oh, good question. I think we can do a lot more with our front page in terms of surfacing good/important productions and providing a good, editorial news stream. The content itself is my job, but we also need to shuffle a few things around and look at some design decisions. That's sort-of my focus right now, but apart from that there are a bunch of small things that could improve the overall experience." Menace comments and concludes: "We are fully open source, including our issue tracker, so it's actually quite easy to see what we're planning for the future (or suggest something we haven't planned yet) - just head over to the complete list." 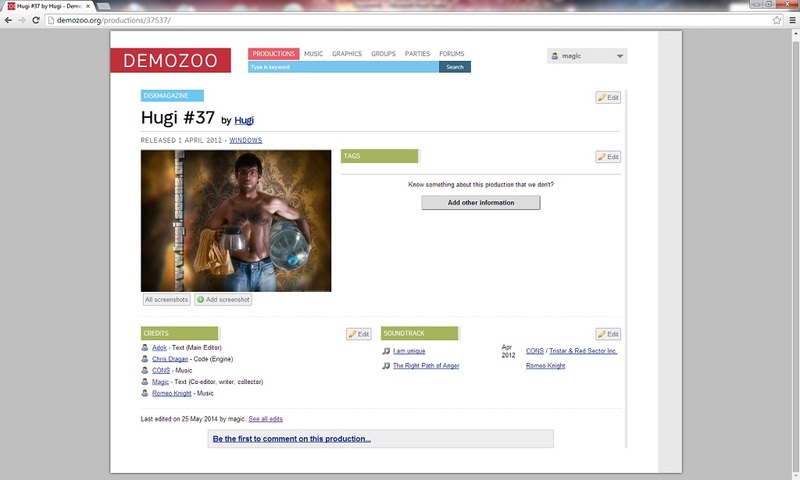 As said earlier, Demozoo was launched in december 2013. At the time of writing this article in may 2014 what statistics can be provided about the number of visiors or productions? How successful is Demozoo in its first half year? Gasman was so kind to give Hugi some hard facts! Gasman: "We've had 33,000 unique visitors since our launch at the end of December 2013 - currently it's getting about 900 visitors a week. We have 593 registered users, out of which 410 have contributed data back to the site. There are currently 44600 productions (along with 23500 graphics and 42200 music tracks), compared to 41000 when we launched - obviously, having the full set of party releases from scene.org contributed a lot to that figure... There's been a big rise in the number of credits on productions, presumably as people have logged in for the first time and noticed the prods missing from their profiles: 48400 now, compared to 36400 when we launched. We have 35700 sceners in the database, across 73 countries (that we know about); There are 11300 groups, and 2200 parties, held in 38 different countries." So how does Demozoo work? Can Gasman and Menace give a short introduction for you, our reader? Why you should visit Demozoo and what you can search for and really do on Demozoo.org? Gasman explains: "Demozoo is a comprehensive, explorable database of the people, productions and events that make up the demoscene, complete with screenshots, soundtrack data, credits, tagging, group memberships, and cross-links to other sites like Pouet, CSDb, Scenesat - with information spanning from the 1980's to the present day, including a significant amount that has never been online before in any form. Since comparisons to Pouet are inevitable... it's like Pouet, but going into much more detail on individual sceners, and the works done by those individual sceners, including standalone graphics and music. I've heard from sceners who were pleasantly shocked to find releases listed against their name that they completely forgotten ever creating :-)" While Menace adds: "As for how the nuts and bolts work, I'll leave that for Gasman to answer :) At Demozoo you will find a demoscene site with a database of productions lovingly created from the ground upto suit the purpose. We offer things like rich metadata for the music parts of the scene, support for any platform, and is open source for anyone to help/tinker with. We allow our users pretty good freedom for editing, and we prefer oversight rather than an approval process for most data entry. We also suppost screenshots of any size and much much more. There are a thousand minor things that make it great, and we can only encourage people to browse and use the site to explore." A lot of demoscene related websites which emerged also dissapeared again for the one reason or another. Hugi wanted to know if Demozoo is a website with a strong foundation next to the founders ofcourse. For example who is hosting the Demozoo website and what is the financial picture behind Demozoo excistence? Gasman explains: "The site is generously hosted by Digitale Kultur in Germany (best known as the organisation behind Evoke, and also responsible for the .de mirror of scene.org). We host screenshots, backups and other large files separately, on Amazon S3 - I guess we must be up to a few tens of gigabytes by now, but it still only comes to a couple of dollars a month. The running costs are well within my everyday budget for enjoying the demoscene as a hobby, so I don't think there'll be any need for fundraising drives any time soon!" While Menace adds: "Digitale Kultur e.v kindly hosts the website itself, while I believe we do pay a small bit for hosting the data (screenshots and the like) on a different service. I'm sure Gasman has the whole picture. 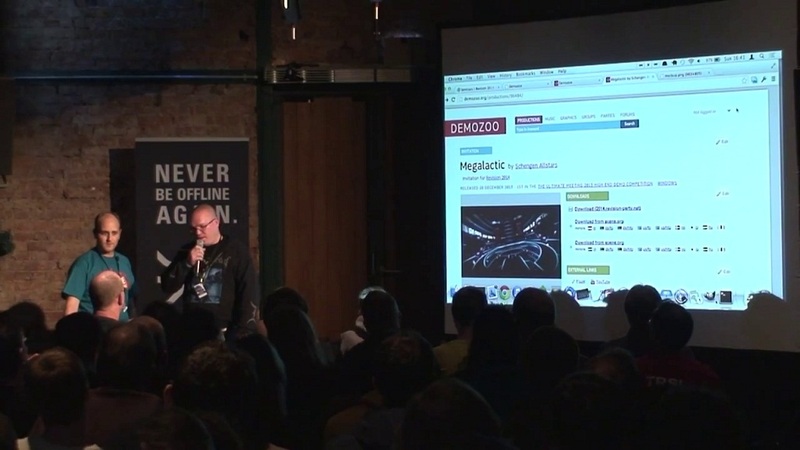 I've asked to help out with paying for it for years, but have yet to be allowed to :)"
During easter 2014 Menace and Gasman gave a seminar at Revision 2014 about Demozoo. What were some of the most important messages and information told in this seminar? Kindly Hugi asked this question to find out. Gasman tell us: "It was only a five minute talk, so there wasn't much more than what I've already told you here... I mentioned some of the ways that our data has been used to contribute back to other demoscene activities. It served as a starting point for Pouet's new credits feature, and we're also providing data exports to Helsinki's Skeneklubi to help them compile their monthly demo shows. We're keen to co-operate with other demoscene projects - if anyone can benefit from a data export or API access to our data, we'd be very happy to hear from them. We also talked about our plans for improving the homepage, especially using it to highlight interesting things that might go un-noticed. I gave the example of ilmenit's Mona Lisa 256b intro on the Atari XL, which was released shortly before Revision: if people are only following a 'latest releases' or 'top of the month' list, those things will tend to get some brief interest and then get crowded out and forgotten after a few days, when in fact there's an audience outside the scene who would love to hear about it, just as much as they heard about the Mercury intro through the wider media coverage." While Menace in a few words concludes: "It was basically a 'this is where we're at currently, and these are our plans' sort of thing." When the end of this article about Demozoo is getting closer Hugi kindly thanks Gasman and Menace for there time and help on this article. Only time will tell about how Demozoo will evolve and what position it will take in the demoscene related universe of websites. Will Demozoo be more popular and useful than Pouet one day? Where will Demozoo stand in 3 years from now? Hugi confronted Gasman and Menace with this questions and asked for a sneak peak into Demozoo's future. Gasman says: "I'd be very surprised if Demozoo ever overtakes Pouet as the demoscene's community hangout of choice. We're not in competition with Pouet, and It's not something we're actively pursuing - we have comments and discussion forums, but only because it would be strange for a demoscene site not to have those things. If Demozoo does build up a community - beyond the core 'data collecting' one - then of course we'll happily build the site in that direction, but it's not something that we'd try to predict or plan for. In very, very loose terms, I see Demozoo being the Wikipedia of the demoscene rather than the Facebook... somewhere to go and find answers, and somewhere that we can point families and colleagues (well, depending on the sort of demos you make...) to say 'this is what we do'." Menace concludes: "It's a common misconception that we're somehow 'competing' with Pouet. In my opinion, we're not. They're doing their thing, and we're doing our thing, and where we intersect, we usually try to cooperate (for example, we gave Pouet a database dump of our credits at the time to get their credits feature going). So, in fact, I hope we both are successful and grow in the next few years. Our success is in no way dependent on us being more or less successful than other sites." 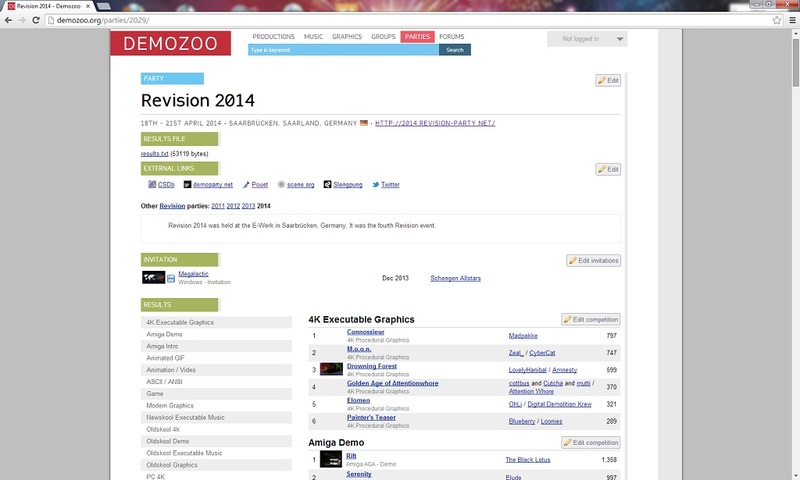 Demozoo, the comprehensive and explorable demoscene database. Visit now! Go make an account and add credits to a production, add a screenshot or add new productions! Or just browse some pages to check it out this relatively young but already mature website! Surf to www.demozoo.org.